GrayRevenge is a complete suite for GNOME 3.4. 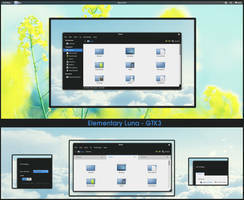 It comes with GTK2, GTK3, Metacity, Unity, Gnome-shell, Cinnamon, Xfwm themes. Slick, fast, and elegant. 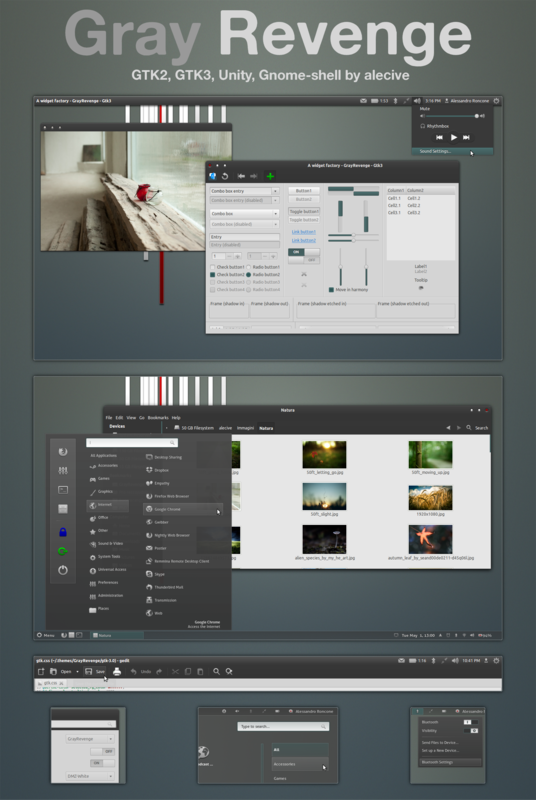 WARNING: this theme works for GNOME3.4 / Ubuntu 12.04 users, but it will not work for previous versions of GNOME or Ubuntu. 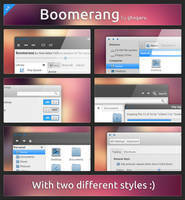 All the credits to minteastwood [link] for XFWM theme. 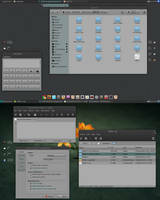 Thanks to satya164 [link] and its Orion theme for made me able to understand new GNOME 3.4 theming and release this suite. Installation instructions and more informations are provided in the README pdf file. 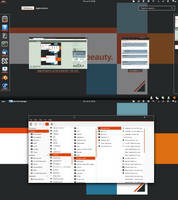 Debian 7.1, xfce4.8, setup to look like gnome 2. 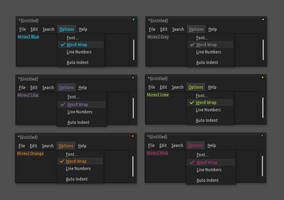 In thunar-vcs-plugin the gtktreeview list that shows the files becomes unreadable and does not honor global text color. Are there any plans to make a theme similar to this, or maybe update this one? THanks! And yes, as soon as they'll keep constant the api I will release a new version for newer ubuntu/gnome distros!! So Ubuntu's on a new LTS version now, GTK has only gotten ten times more insane, and it seems like it's slowly dying out anyways. I'm guessing the chances of seeing an update at this point are pretty much zero? 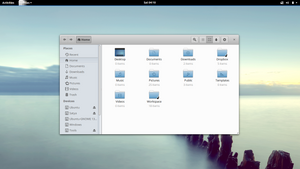 Yeah, it doesn't seem like gtk's really constant from one version to the next anymore. I'll be keeping an eye on this one Hope to be able to use it at some point in the future. Hello. As I said in my last journal entry, I dropped development (and support) for any gtk/wm theme I created, since gnome developers are messing around with latest releases and I don't have neither enough time nor the enough willingness to stay up-to-date with their playground and completely redesign my theme from scratch since their API broke the old one. I will start again in the moment in which gnome theming API will be more stable (hopefully, with 3.10 release in next september we will see something good ). I'm thankful for your appreciation regarding the theme, but unfortunately I cannot help any more. And it's not my fault! Where is the download LINK!? I'm sorry, only linux. But this can be a good reason to try it! I wish, but it's too difficult. Maybe for 3.8 or even 3.10. I'm sorry , but gnome developers are messing around and I cannot follow their fast and disruptive development. /usr/share/themes/GrayRevenge/gtk-2.0/gtkrc:322: Unable to locate image file in pixmap_path: "Others/null.png"
/usr/share/themes/GrayRevenge/gtk-2.0/Styles/tabs.rc:16: Unable to locate image file in pixmap_path: "Tabs/horizontal-tab-bottom.png"
/usr/share/themes/GrayRevenge/gtk-2.0/Styles/tabs.rc:26: Unable to locate image file in pixmap_path: "Tabs/horizontal-tab.png"
/usr/share/themes/GrayRevenge/gtk-2.0/Styles/tabs.rc:36: Unable to locate image file in pixmap_path: "Tabs/vertical-tab-left.png"
/usr/share/themes/GrayRevenge/gtk-2.0/Styles/tabs.rc:46: Unable to locate image file in pixmap_path: "Tabs/vertical-tab-right.png"
/usr/share/themes/GrayRevenge/gtk-2.0/Styles/tabs.rc:55: Unable to locate image file in pixmap_path: "Tabs/tab-active-top.png"
/usr/share/themes/GrayRevenge/gtk-2.0/Styles/tabs.rc:64: Unable to locate image file in pixmap_path: "Tabs/tab-active-bottom.png"
/usr/share/themes/GrayRevenge/gtk-2.0/Styles/tabs.rc:73: Unable to locate image file in pixmap_path: "Tabs/tab-active-left.png"
/usr/share/themes/GrayRevenge/gtk-2.0/Styles/tabs.rc:82: Unable to locate image file in pixmap_path: "Tabs/tab-active-right.png"
Did you install pixmap engine? Thanks for the response. It doesn't look like pixmap is in the repo anymore (Linux Mint). But on what version of gnome are you? I'm no expert when it comes to themes, but isn't this happening because there is no gtk-2.0/Styles/Tabs folder in the theme? Basically, it looks like those images are missing in the download? Yes. But the problem is that in the new version there isn't the need for this folder since I should have dropped its dependence. What version of GrayRevenge are you using? I re-downloaded and re-installed the version on this page. Same problem still. Awesome theme. About the best I was able to find. Still don't like the small differences between gtk2 and gtk3 apps' looks, but at least everything looks similar and aesthetically satisfying. Haven't had that feeling since Equinox Evolution became useless because of gtk3 release. 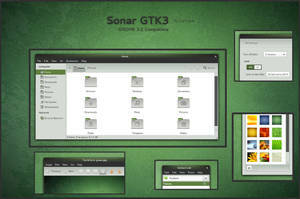 GTK+ 3.6 seems to have another theme format or something. Button and menu backgrounds are mess after the update. Yes I'd have to to the porting. 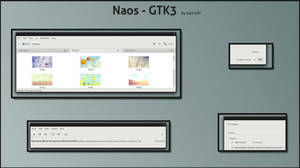 But unfortunately for the lack of spare time I have to wait until I will release the new version of AwOken icon them and the gtk 3.6 porting of ANewStart theme. So, probably, I will get a new version of GrayRevenge only with the next 3.8 release of gnome. I really like this theme as it reminds me of Evolution Equinox in terms of color and style. I did encounter a bug where the drop down menu for the search bar in Firefox is white, making it unreadable. Will there be other colors for the colored elements, or will it only be the teal-ish color it is now? Can you post a screenshot of your issue? I've been trying to recreate the white menu bug, but so far it hasn't happened again. It must have been some odd Gnome bug that got fixed since it happened after waking my system from sleep mode. Still i have problem with fiting appropriate FX theme,any sugestions? Sorry, could you explain yourself better? Can you show me a screenshot? Sure, here a two caps from my desktop as you can see gedit is having troubles too to show the correct theme for gtk just like terminal and the wireless submenu. That's because you only saved the theme for your user account and not the root account. Copy and paste the themes from your ~/.themes/ directory to /root/.themes/ , the same applies for icons. You surely miss some engines. It's (almost) completely broken! What distro are you using? What version of GNOME?